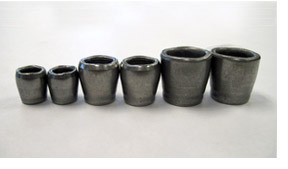 USA made, family owned and operated, quality hammer wedges, ferrules, powder acuated clips, secondary and more. TACO Fasteners Inc. manufactures products for the building, electrical, hardware, mining and striking industries. TACO Fasteners owns and operates a 22,000 square foot manufacturing plant in Plainville, Connecticut. Using our expertise, we have developed the safest wedge on the market. Round Metal Wedges give 360° maximum wood displacement virtually eliminating loose heads on hammers, sledges, axes and mauls. Pull out tests have been up to 8,000 lbs. One conical safety wedge eliminates the need of a wooden wedge and multiple flat steel wedges. 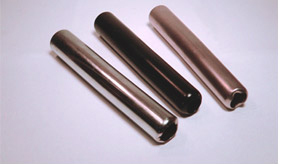 TACO Fasteners Inc. specializes in the manufacturing of ensilage, manure and spading fork ferrules. For over 25 years TACO Fasteners Inc. has been an industry leader in the manufacturing and assembly of EMTC, ceiling clips and top hat fasteners. All parts are manufactured and assembled to customer specifications. We use in-house tooling design and build to customer specifications. TACO Fasteners Inc. manufactures hardware up to 75 tons press capacity. 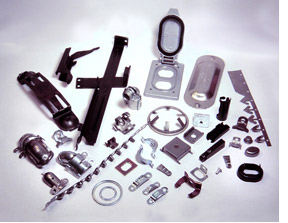 Our capabilities include assembly, progressive and secondary die work. Retaing clips are used when seating striking heads onto fiberglass handles. The clips are inserted into the notch on the handle and provides stabilization and strength when epoxy is poured into the striking head. Can be used on hammers, sledges, axes and mauls. TACO Fasteners Inc. currently manufactures eight standard sizes but has capabilities to make additional sizes to fit customers individual requirements. 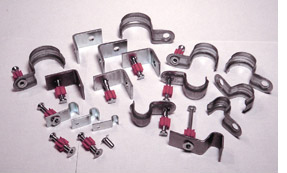 Ceiling Clip Assemblies are a method of suspending acoustical ceiling grids and panels from concrete. All clips and assemblies are made to customer specifications. Fastening Top Hats secure and stabilize fastening pins. Top Hats are 13/32" long and can be made to secure any different diameter fastening pins. Top Hats are made to customer specifications.